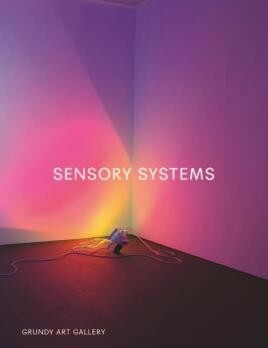 Unfortunately, due to sales rights restrictions, we cannot offer Sensory Systems for sale in your country. Sensory Systems documents an engaging group exhibition presented at the Grundy Art Gallery, Blackpool, in autumn 2015. The exhibition is the first in a new annual programme by the gallery each autumn that will revolve around the theme of light, and timed to coincide with the famous Blackpool Illuminations - a six-mile-long outdoor display of lights that has drawn many visitors to the town each year since it was first switched on in 1912.
artwork presented in the exhibition invited a dialogue with the viewer, utilising colour, pattern, movement and other factors to evoke a variety of spatial and sensory experiences. the early pioneers in the field, alongside figures such as James Turrell, Mary Corse, Robert Irwin, Carlos Cruz-Diez and Dan Flavin. McCall, who moved to New York from England in the early 1970s, was highly influential with his ‘solid light' installations. In this exhibition and publication, McCall presents You and I, Horizontal (2005), a slowly evolving, curving sculpture made of light. The publication includes a foreword by Richard Parry, Curator at the Grundy Art Gallery, an essay by Dr. Luke Skrebowski, Director of Studies in History of Art at Churchill College at the University of Cambridge, and has been designed by Joe Gilmore / Qubik. The project has been supported by Blackpool Council, Coastal Communities Fund, Arts Council England, and is co-published by the Grundy Art Gallery and Anomie Publishing. The publication is distributed internationally by Casemate Art.